Just like CVS and Rite Aid, first things first is you will need their Balance Rewards card. You can sign up and get your card at any Walgreens store. 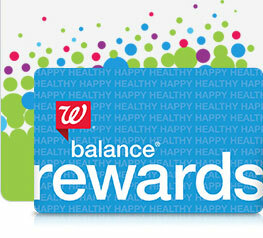 With this card you will be able to take advantage of Walgreens rewards system. They have 2 types of rewards, Balance Rewards points and register rewards. Lets talk about both. Balance Rewards points are similar to Rite Aids points system. On their tags or in the weekly ad you will see “spend $30 get 10,000”. That 10,000 points is equivalent to $10. You can now (recently, woohoo!) use points to pay for your transaction and get points back. The next type of reward is register rewards which is exactly like a catalina coupon. A catalina coupon will print from the catalina machine and the RR will be a dollar amount off on your next order ($5 off on your next order). Whether these coupons roll is completely random. Most of the time RR do NOT roll but sometimes they do. There is no for sure way to tell besides trial and error. 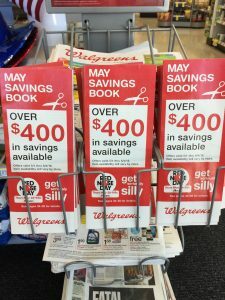 Walgreens also has store coupons, we call these IVC’s. They are found in the monthly savings booklet at the front of the store next to the weekly ad. If you cannot find them ask an employee and I am sure they will find you one. These store coupons will stack with a manufacturer coupon. You only need 1 IVC coupon per transaction. IVC coupons attach to every item in your transaction with just 1 coupon. Softsoap body wash is on sale for $3.99. There is no limit to how many register rewards you can get per card however only 1 will print per transaction. So in order to get many (up to the stores discretion) you would have to do multiple transactions. Twizzlers are on sale 2 for $4. With points you don’t need to separate the transaction if you want to buy more then 2, you can buy 4 and get back 2,000 points. Zantac is on sale for $8.99 each. Do you see how much money you can save?! Saving money is AWESOME! Remember to print store coupon policies and study those as well. This wraps up our Coupon 101. Take as much time as you need to go over each store and in doing so you will gain confidence in your transactions. Although we have set up this coupon 101 for you all the absolute best way to learn is with trial and error. Everything posted on our coupon101 is the best information available to us and our own personal experiences. We hope you thoroughly enjoyed learning how to coupon and for sticking with us this long. Remember to check the blog often as new deals are posted frequently. Happy savings!